houses all over Roeshot Hill. 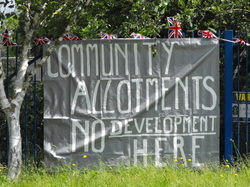 -that there were no meaningful discussions between the borough council, Meyrick Estates Management and Roeshot Hill Allotment Association. The council officers disputed our version of events but did not have the actual figures of the people’s preferences for the inspector. We have never met with MEM. You will be thrilled to know that CBC and MEM are “committed to securing a site that provides suitable replacement allotment facilities that are better than those currently leased to plot holders” So that’s all right then. It does not say anything about soil quality. We learned that the borough council was to refuse our request to nominate our site as an Asset of Community Value, not surprising as nomination could have chucked a spanner into the Core Strategy works. We learned that the highways planners at Dorset County Council are blithely unconcerned at the traffic chaos that could well result from all the homes built on Roeshot Hill. They will not have to live there. We also learned how democracy works. The people of Christchurch voted for what you wanted in 2010 but the council did what it wanted to do anyway. pre-hearing meeting of 30th July and were given till 28th August to hand in our submission - no register, no take part. There are all kinds of documents circulating within the Inquiry such as Statements of Common Ground or FD2 to help move things along, or influence the outcome perhaps. They may well be on line somewhere but ordinary people like us have lives to lead. We have sent in a response to the council’s recommendation to refuse our application and added the comments of the Green Flag Inspector but we are not holding our breath.